Indian Institute of Management Amritsar successfully conducted the third version of its annual HR conclave ‘Yukti’18’ on Saturday. The conclave provided a platform for the students and the panelists from well-known organizations alike to discuss about various contemporary HR practices. The panel discussion for Yukti’18 revolved around the umbrella theme – ‘HR Business Partnership’. The event saw two panels discussing on the themes ‘Challenges with People Analytics (Era of Digital HR)’ and ‘HR Artistry – Developing an inspired workforce through artful HR’. The conclave involved active participation from the students who delivered effective presentations on the aforementioned themes and set up the stage for the panelists to take it further and the audience to actively listen and participate. 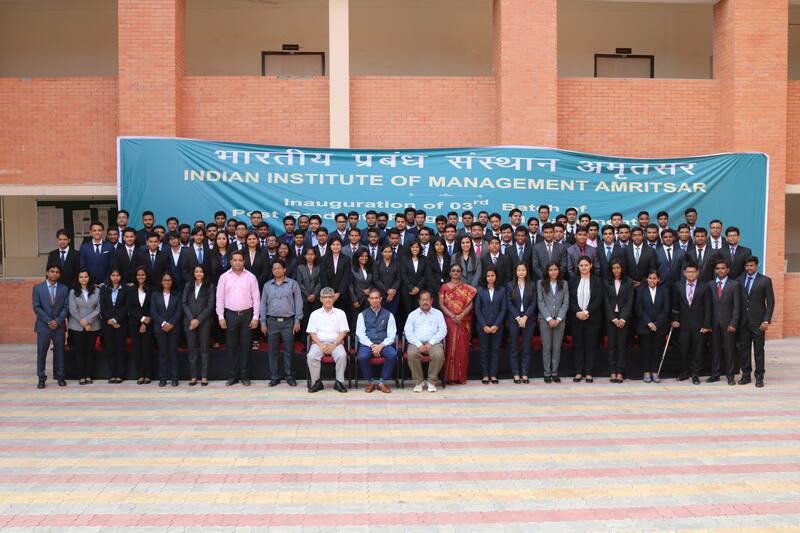 Students of IIM Amritsar delved into the topics like People Analytics and the gist of statistics and tools involved. Students also talked about various concepts – origin, implementations, needs, challenges etc with. Human Resource Business Partnership Models, the effectiveness of Dave Ulrich’s HR model, the four key roles of HR and how modern data and human intelligence is homogeneously mixed to make it sustainable, the basic concepts of Artistry in HR and many other concepts. Discussing on the disruption brought by the spate of excessive data, the first panel discussed on the theme ‘Challenges with People Analytics (Era of Digital HR)’. The panel highlighted multiple facets of HR Analytics with the inclusion of processed information. The panel emphasized the importance and omnipresence of data in almost every industry and exhorted the future managers and game changers to update and upgrade themselves to flow with the tide. However, much emphasis was also given on the subliminal learning of these new technologies using subtle nudges and pull techniques. Integration of horizontal functions and uniformity in the pace of change is also deemed important for effective HR practices. The panel warned the managers not to go blindly go behind tools and employ change in a sustainable way, so that the employees – the real drivers of any process could overcome their resistance and align themselves with the new way. The panel also focused on using the tools and the methods judiciously and should always carry out the returns of such projects and always keep an eye on the balance sheet. Thus, though data and the analytical tools are promising to give a firm a competitive edge, it is the assimilation of this knowledge with the human expertise and the organizational strategy that would create the firm on the higher pedestal. The second panel discussed on the topic ‘HR Artistry – Developing an inspired workforce through artful HR’. While discussing, the panel raised that though, with the infusion of data and analytics, HR is increasingly adopting a scientific facade, HR practices in essence always have an artistic nature. The panel also discussed within themselves the different facets of HR Artistry. Making a model sustainable and scalable to reach out to every stakeholder, internal or external, it is imperative that the organizations bear some artistry in HR practices. Taking an example of Apple, the panel also suggested that inclusion of Art into HR can also work as a Point of Differentiation and consequently an added advantage for the firms. The panel recommended that the aspiring firms should aspire to become People Employers. This would be possible only by a careful balance of emerging technologies with the emerging culture. The panel also received the questions of the audience where they explained that HR’s ABC – Ambition – to lead and to support, Bravery – to put people first and manage them in new ways and Creativity – to design new, innovative and unique approaches to gain competitive advantages are the keys for HR to be more artful in their rules. The eminent panelists in the first discussion included Mr. Mukesh Tiwari, Head Talent Acquisition (Asia Pacific), Caterpillar Inc., Ms. Hema Mohandas, Vice President, Learning and Development, Virtuasa, Mr. Antaryami Patra, Talent Acquisition, HCL Technologies, Ms. Anju Malhotra, Talent Acquisition and Business Head, HR, JK Cements and Mr. Swarup Dumpala, Head, Talent Acquisition, Karvy. The eminent panelists in the second discussion included Mr. Manmohan S. Kalsy, CHRO, United Breweries Ltd., Mr. Sanjay Srivastava Director HR, Boehringer Ingelheim, Ms. Kamalika Deka, Regional Head HR (North), Jubilant Foodworks Ltd., Mr. Manoj K Prasad, Vice President, Talent, Digital Transformations & Learning, Mr. Harjeet Khanduja, Vice President, HR, Reliance Jio, Mr. Parthsarthi Mishra, CHRM, Tata Steel. The event commenced with Lamp Lighting ceremony by the esteemed panelists, and the PGP Chair Prof. Geetha M, Placements Chair, Prof. Arun Kaushik and Students Affairs Chair, Prof. Mahima Gupta, and concluded with a Thank you note by Prof. Umesh Kumar.